Gouramis are one of the most popular aquarium fish species, and for good reason! These Anabantoids (closely related to bettas) are a great choice for the top water layer of a peaceful community aquarium with their interesting behavior and often striking colors. There are quite a few gourami types available in the aquarium trade nowadays, so keep reading for a list of the most popular gouramis to find out which one best suits your own aquarium. Previously named Colisa chuna, honey gouramis (pictured above!) are named after the male’s striking orange-yellow coloration. They are a relatively small gourami species, which makes them suitable for smaller setups: a rectangular tank of at least around 15 gallons (57L) is a good place to start for a pair. Be sure to go for peaceful tankmates such as Corydoras species! Like all gourami species, honey gouramis love relatively soft, dark, acidic water and plenty of cover. Plenty of floating plants will be appreciated and you can add some Indian almond leaves that release tannins to stain the water and imitate the natural habitat of your honey gouramis. Be sure to baffle your filter – these fish come from relatively stagnant waters and don’t appreciate a strong water flow. 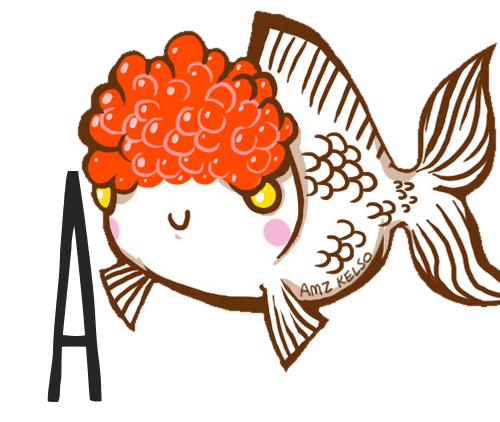 Like all labyrinth fish, they also need to have access to the surface to breathe air. Chocolate gourami is a collective name for a few mouth-brooding fish in the genus Sphaerichthys, although Sphaerichthys osphromenoides is the most popular and also considered the easiest type to keep. This doesn’t mean they’re suitable for any community tank, though: many aquarists choose to keep these feisty fish in a single-species setup or in a carefully chosen peaceful community with calm tankmates that prefer similar water conditions, like Rasboras. Chocolate gouramis can be kept in relatively small aquariums: a rectangular tank of at least around 15 gallons (57L) should be enough. You can keep these fish in pairs but a group is also a good option, especially if you’re interested in breeding! To set up a successful chocolate gourami tank, keep in mind that these fish love a densely planted setup with stained water, so don’t go easy on the aquarium plants. Pearl gouramis (also known as diamond gouramis) are named after the bright, pearl-like spots that cover their entire body. 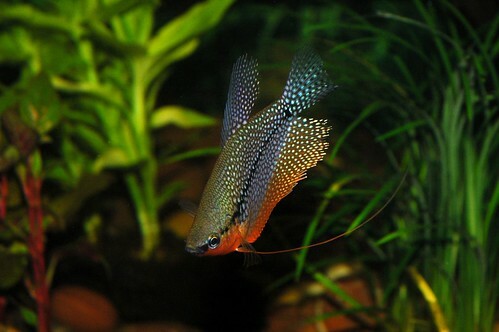 They are a stunning gourami variety and the males have a striking orange-red belly. Unfortunately, unlike the two species mentioned previously, these fish do require a slightly larger tank: an aquarium length of at least one metre (3.3 ft) is a good idea. Pearl gouramis make great fish for densely planted community aquariums but like all gouramis they prefer to only be combined with peaceful tankmates. The species on this list are great options! Pearl gouramis are usually kept in couples or small harems; keeping multiple males together can cause some territorial issues unless the tank is relatively large and densely planted. If you’re looking for an unusual gourami with striking colors and interesting behaviors, you’ve found it! Liquorice gouramis are definitely not the most common gourami species in the aquarium hobby and not the easiest either, but if you’re interested in setting up a biotope tank without tankmates this may be the fish for you. Liquorice gouramis are one of the smallest gourami species and a pair can be kept in an aquarium of at least 10 gallons (38L). The light should be dim, so staining the water and using floating plants is a good idea. Because dense planting is also appreciated, it’s a good idea to go for very low light plants such as Java fern. To imitate the natural habitat of your liquorice gouramis, use very soft and acidic water and keep water flow to a minimum by baffling your filter. 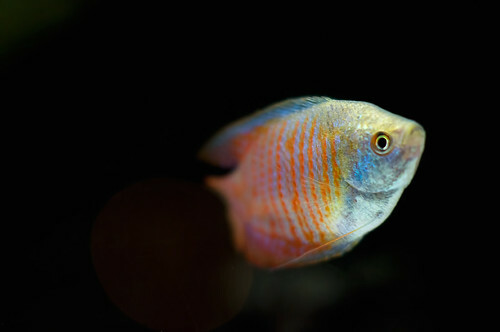 Water quality should be pristine and the tank should be fully cycled, as these colorful little fish are very sensitive! 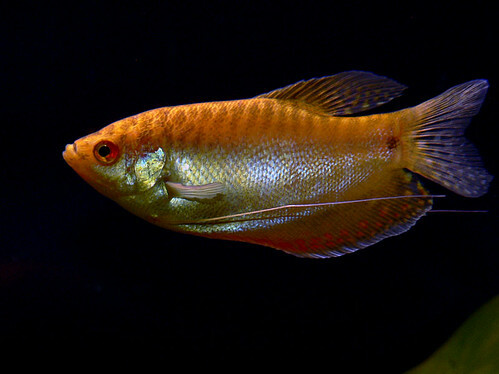 Undoubtedly the most popular gourami species available in the aquarium trade, the brightly colored dwarf gourami is unfortunately often the victim of improper care and lack of knowledge. Although they are a smaller gourami variety, dwarf gouramis are not suitable for very small aquarium setups: for a single pair, a 15 gallon (57L) long tank is the minimum. These fish are also not a great choice for just any community, as they can be both territorial and very shy and will do best with calm, peaceful tankmates like kuhli loaches. As with all gouramis, a densely planted tank with relatively soft, acidic water is appreciated. A common problem with dwarf gouramis is that they are mass bred on a massive scale causing stock to be of low quality and, more alarmingly, wide-spread contamination with dwarf gourami iridovirus. This means you should always have a close look at any dwarf gouramis before buying them! This tiny gourami species is also known as the dwarf croaking gourami because they are the only gourami species to produce a sound that the aquarist can hear: these fish croak! This interesting trait, combined with the fact that they can be kept in setups of at least 10 gallons (38L, rectangular tank), makes them a popular choice for small, well-planted setups. Keep these fish in pairs or small groups; in slightly larger aquariums, you can also go for peaceful tankmates such as Rasboras. Be sure to densely plant the tank and use a baffled filter. Blue gouramis, also known as three spot gouramis, are one of the larger gourami species. They are also available in other color varieties,, such as gold or a marbled blue, so don’t be confused if you see an entirely different looking fish labeled as Trichopodus trichopterus! A tank of at least 1 metre (3.3 ft) is recommended for a pair or small harem of these fish. Keeping two males together is not recommended, as they can become quite territorial. Blue gouramis are not the best community fish, although it’s not entirely impossible to keep them with tankmates. 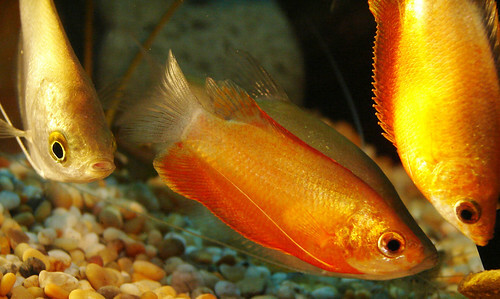 Nippy fish such as some barb species are not recommended as they may try to nibble at the gourami’s long ventral fins and very small tankmates may be eaten or damaged themselves. Other gouramis, loaches and larger schooling fish are a better choice. As with all gouramis, a densely planted tank is appreciated and be sure to always keep in mind that these fish need access to the surface to breathe air (as explained here). This list doesn’t include all gourami species available in the aquarium trade, as there are many more: moonlight gouramis, thick-lipped gouramis and even the giant gourami! However, the species here are most popular and most likely to be found in your own aquarium store. If you have any more questions about keeping these gourami species or want to share your own experiences, don’t hesitate to leave a comment below! I’ve just restarted my ten gallon tank after losing four danios in a move. I’m looking into gourami to make home in the newly empty tank. I’d really like to have a pair (one male powder blue dwarf gourami and a male red fire dwarf gourami) in the ten gallon but I’ve heard that the males would get aggressive. I’ve also heard though that if they’re rather peaceful and would swim together. Should I just go with one, or would the pair swim nicely together? Sounds like a lovely pair but I don’t think my local Petsmart has sparkling gourami. Thanks again for the help! I think I’m just going to get the one dwarf and see how he does. I really urge you to decide against the dwarf gourami, even if you get only one. Their minimum tank size is just larger than a 10 gallon and there’s not really a way around that. You can try ordering sparkling gourami online or, if that’s not an option, please choose another fish species. I know it’s a bummer when you can’t keep the fish you’d like to, but that’s unfortunately just the way things work in the aquarium world. Sorry to keep bugging you about the dwarf gourami I seemed to have missed this comment. Well, I think I am going to look for a different specie. I left another comment on the cherry shrimp before I read this last comment, just ignore that one. If you are really into gouramis, you could check “paradise gouramis” as a potential choice for your tanks. They can do really well in hard water and unheated tanks. Check them out, the scientific name is”Macropodus opercularis”. which gourami, if any, would be best in a large tank (~80 g) with about 20 rasboras and cardinal tetras in aggregate, two mid size (6″ tall) angelfish, and a pair of six inch twig catfish? I’m not a huge fan of gouramis and angelfish together! There is no guarantee whether it will go right or wrong. You’re usually best off keeping angels as the only “predators”. 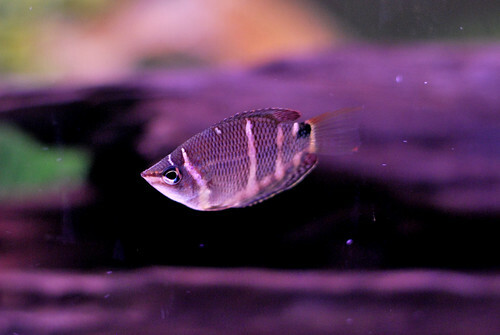 I would love to have a Gourami sp. but my tanks are unheated by choice, and my local water is certainly not soft. Too bad, such beautiful fish.